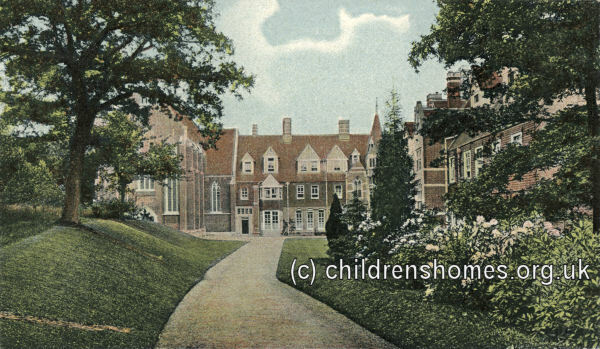 Up until 1885, the St Stephen's Home for Girls, run by the Sisters of the Holy Cross, was based at Kennington Park, London SE11. It was then closed for a period, while the Sisters were in temporary accommodation pending the opening of their new headquarters at Bolnore Road, Haywards Heath, in Sussex. As at Kennington, the Home was run under the direction of another Anglican order, the Fathers of St John, Cowley. At Haywards Heath, up to 60 girls could be accommodated, ranging in age from infancy to their leaving at 18 years to go into service. The lower age of admission was subsequently increased to seven years. Some of the children were not orphans but children from families who could not cope with one more child or whose parents were not able to care for them adequately. Those recommended by the Sisters or the Associates of the Home were received free, the remainder on a payment of 5s. weekly. Holy Cross Home site, Haywards Heath, c.1910. Below is an extract from the memoirs of a Sister who later served at the Home. In 1887, an Orphanage was opened and attached to the Motherhouse. Here 45 girls are received and taken entire charge of by the Sisters. They come from all parts, though mainly from our own Mission Parishes or at the recommendation of Associates. They are admitted at any age between 7 and 10 years and remain until they are 18. The children are taught in our own school, which is under Local Inspection. Modern methods are in use; kindergarten for the little ones, singing, organised games and drill with dancing for the Seniors — nature study with long walks forms part of the school curriculum. The girls from 14 to 16 years continue their education in the afternoon and evening, manual work being done in the morning. They are trained in every branch of domestic work, household and general management and accounts. They learn for themselves something of the value of money through what they earn by marks and good conduct. In their last year, they are allowed to specialise in the branch of domestic work for which they seem best fitted in the future. The children have the usual Elementary School Holidays but they are spent at the Convent — they never go to their own homes but parents and relatives may come to see them on visiting days — the first Monday in each month. They are given an annual outing to Brighton, and many other simple amusements, which are provided by generous friends. The general liveliness and happiness of the children is frequently remarked upon. On leaving, every girl receives a complete outfit, which she makes entirely herself, under supervision. A Guild has been formed which keeps the old girls in touch with the sisters. The means to carry on our work is supplies in a small way by payments made by the parents of the children and by our Associates and other kind friends, who either adopt a child or pay something towards her maintenance. This, however, is wholly inadequate to provide for the food, clothing and education, which each child receives (often for a period of eleven years). In spite of many, generous gifts in kind — clothes, old and new, books and educational requisites (for which we are very thankful) the work is largely dependent on voluntary subscriptions or donations. These may either be sent direct to the Convent or can be given to the Sisters who collect in different districts. May we take this opportunity of recommending to your Prayers this work which is being carried out on catholic and modern lines for the children of today. Afternoon confirmation classes were provided for those over 14 and at least one of those teaching had to hold a Government Certificate as the School was under Inspection. After the passing of the Widows' and Orphans' Pension Act in 1926, its income was significantly reduced as was the number of applications for children to be admitted. In the same year, it was decided to close the Home. The children were dispersed, with those over 16 at their own request going direct to service, while the younger were received into the homes of other Communities. The Sisters finally left Haywards Heath in 1978 and moved to Rempstone, Nottinghamshire. The former convent buildings at Haywards Heath have now been converted to residential use. Many of the Home's former girls kept in touch with the Sisters throughout their lives, the last one dying at over 100 in 2014. An annual 'Old Girls' Day' was held, even after the move to Rempstone, but as many became unable to travel the last one took place in the 1980s. As the girls died, many of their own children began to correspond with the Community, including several who emigrated to Australia, New Zealand or Canada. Thanks to the Community of the Holy Cross for information about the homes.